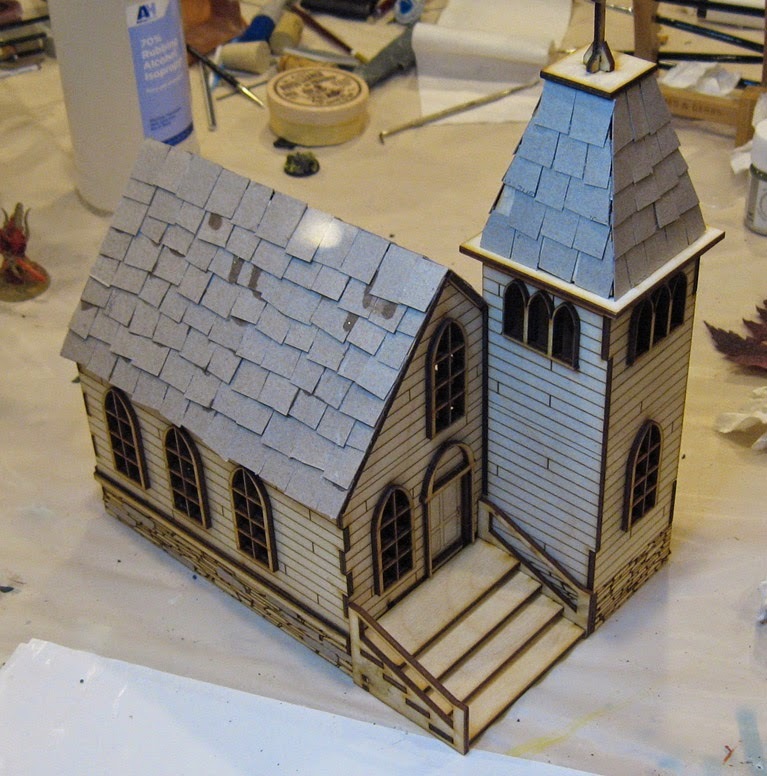 Here's the rest of stage one for the Burn In Designs church. 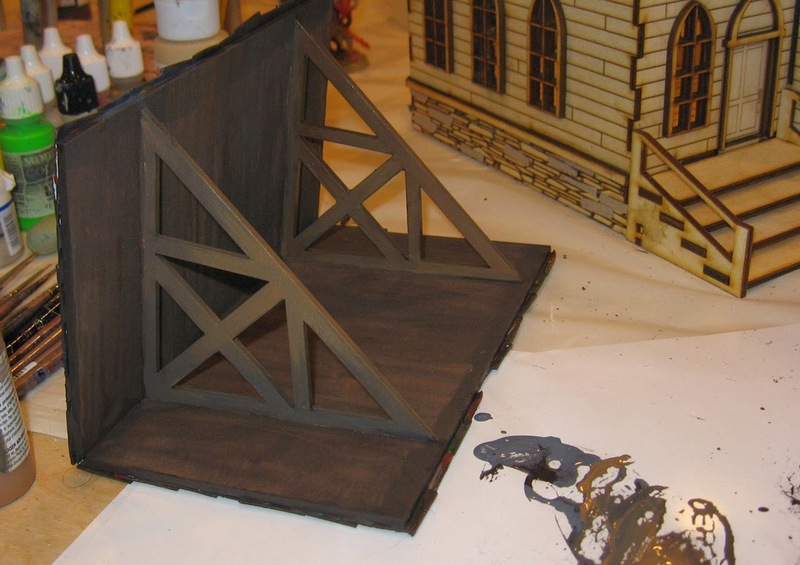 As I mentioned last time, this is essentially Shaded Basecoat for terrain. This means that I want to get every surface covered with some kind of color. 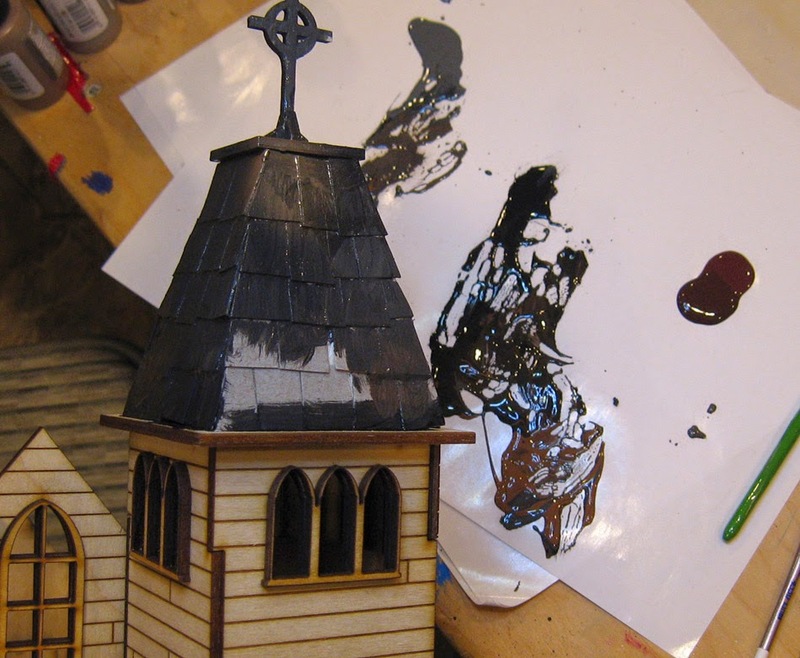 Doing so provides "context" for each color, and prevents something from being painted too light or too dark. That can happen when you only focus in on one small area, and you have nothing near it for comparison! So, I am starting out with the darker foundation rocks. I am trying to incorporate some grey in with the reds and browns. 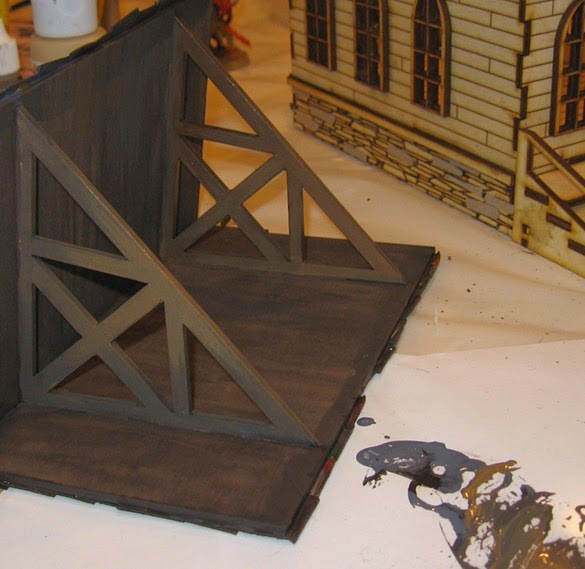 To get a little separation from the foundation, the steps will be tan and grey. Subsequent layers will have a hint of green as well. 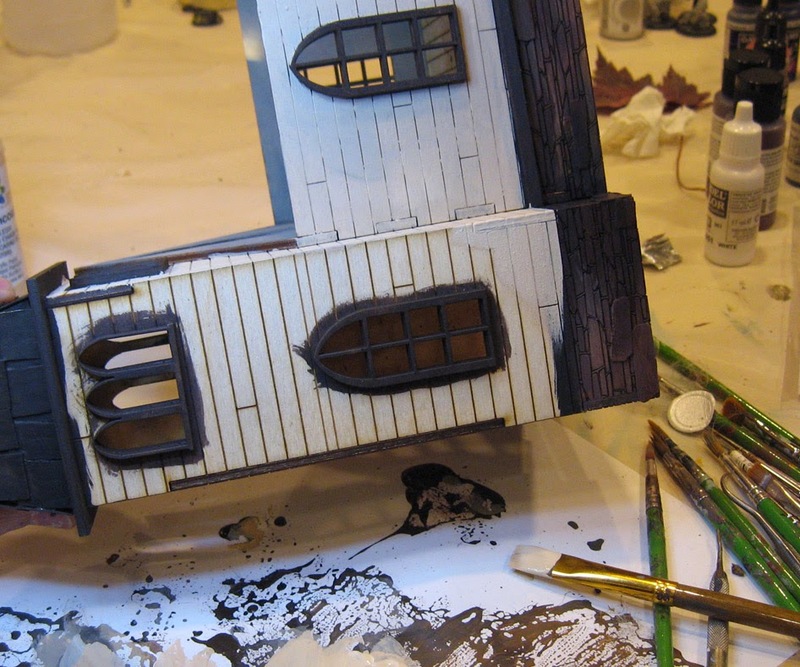 Getting paint on all the window surfaces takes a bit of time. You really have to jam the brush in there to get all the surfaces covered. While some of this will get painted over when the walls are painted, that's OK. It will be a lot easier to touch those up, and they still need their own highlights later in any case! For the interior walls, I want a bit of an aged plaster look. 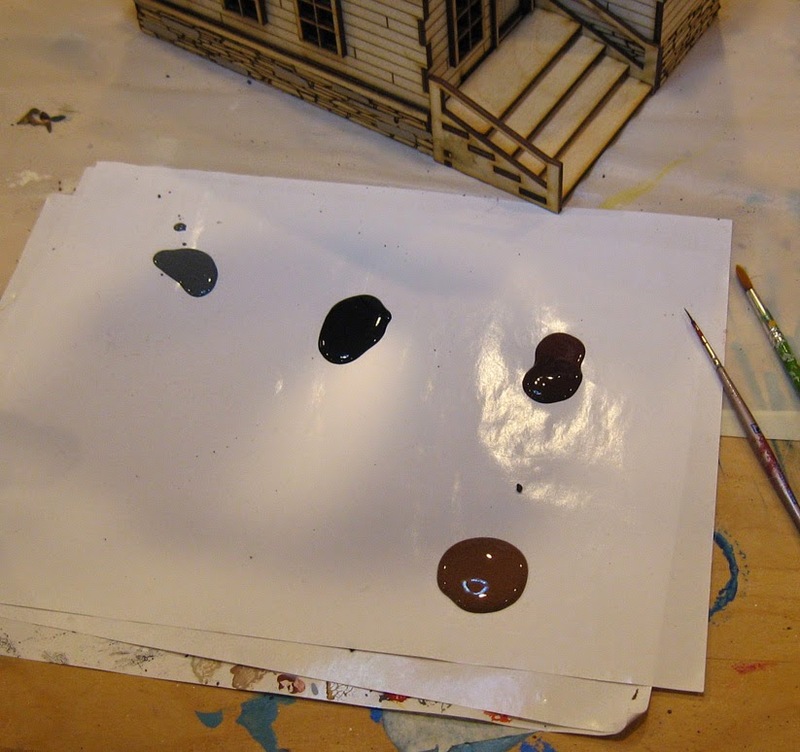 I have an ivory white and a few different types of deep brown... more like a Van Dyke brown for you watercolor fans out there. 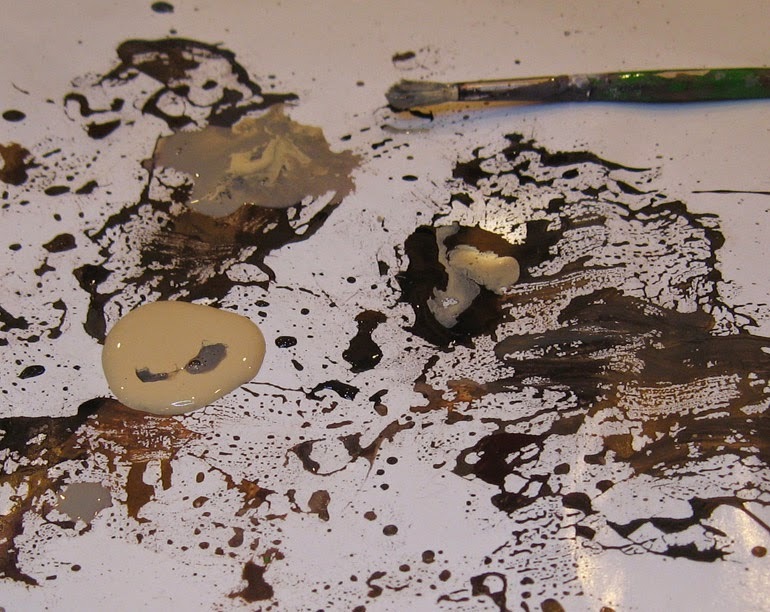 You can see that I have my usual concoctions on the palette. This area will require a lot of "on site" blending, where I will place colors on the surface and scumble them together with the brush. 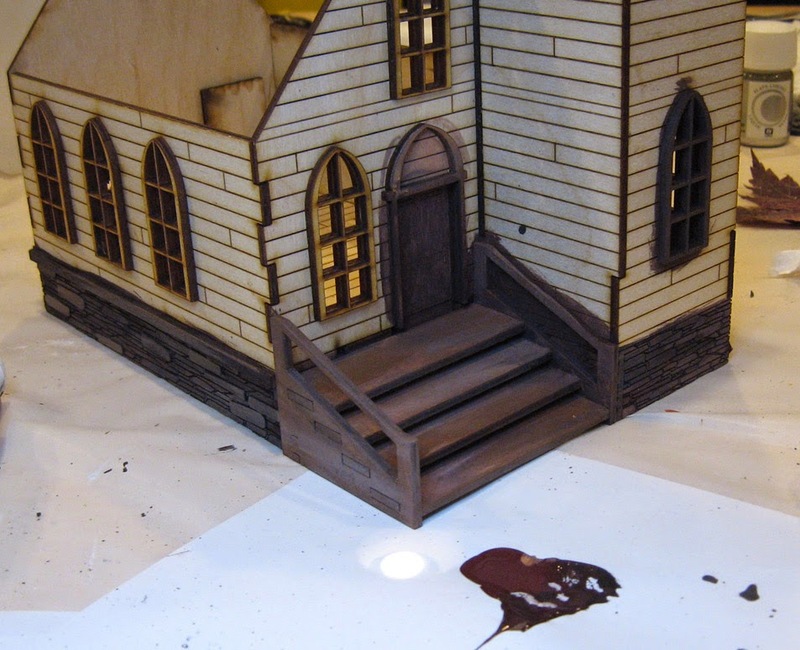 The wood is absorbent enough to soak in the paint, but not too much where it will prevent moving that paint around once applied. Generally, I tried to focus the darker grays towards the top of the walls, possibly indicating years of candle soot. 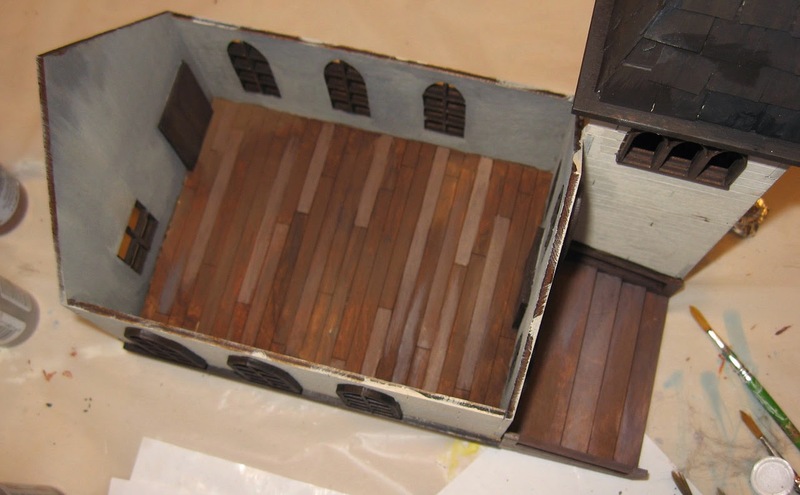 Interior walls almost ready for plaster cracks, wall sconces, and a wooden cross that I am working on. 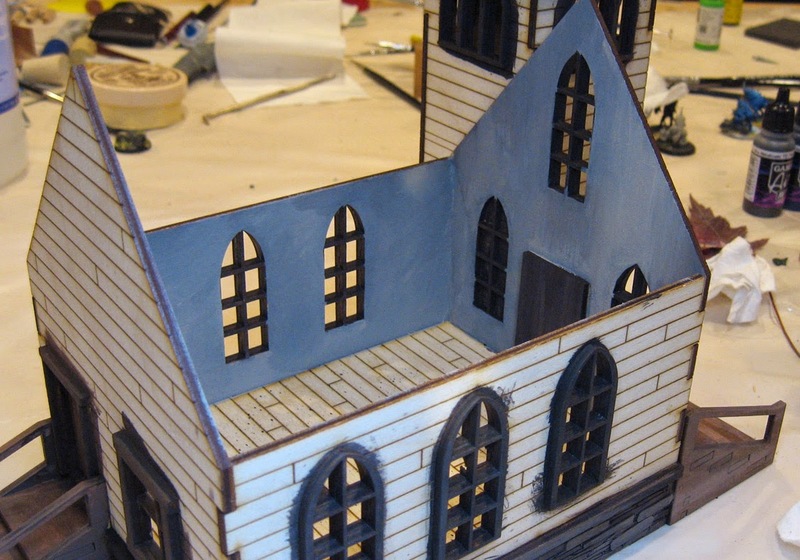 At this stage, I just want to get a general light color on the exterior walls while the inner walls dry. I used a large, chisel edge flat brush to work around the window. Again, no need to worry about hitting those with paint. 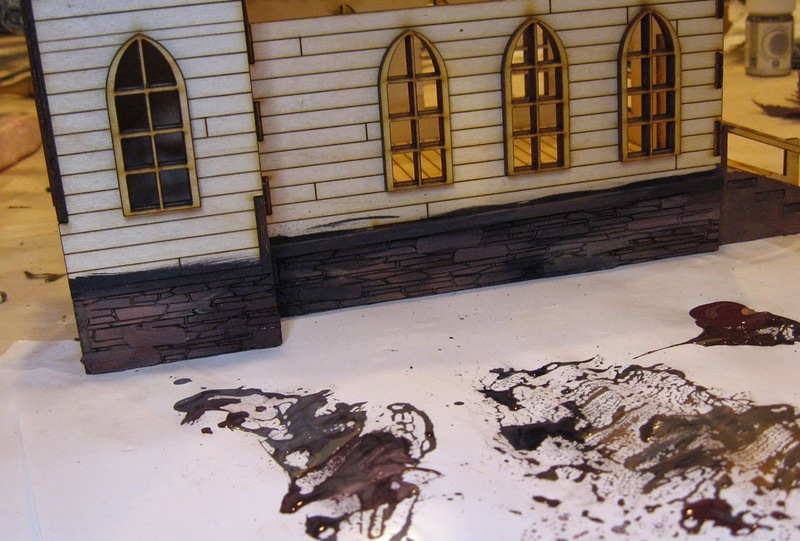 I will be going over the outer walls with subsequent layers of paint and powders.. The interior. These are the warmest colors I have used so far... way more yellow than anything you have seen. I am trying to get a little bit of color distinction here. To get even more color splash inside, I think I will be doing lots of blood spatter and pools inside. This will really indicate just how rough the town of Wappelville can get! The earliest stages are now complete. 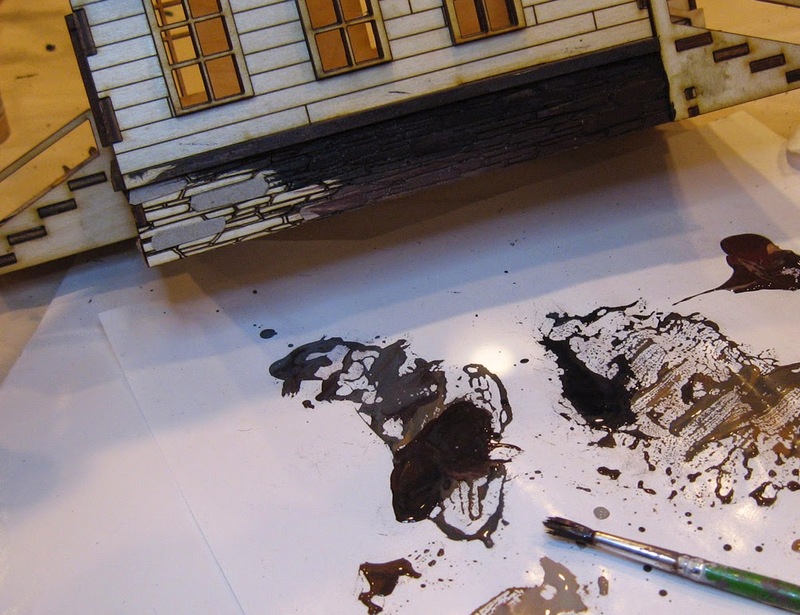 From this point, I can work to establish more contrast and definition, as well as weathering and other special effects. Stay tuned!!! Raise the roof... get me to the church on time. 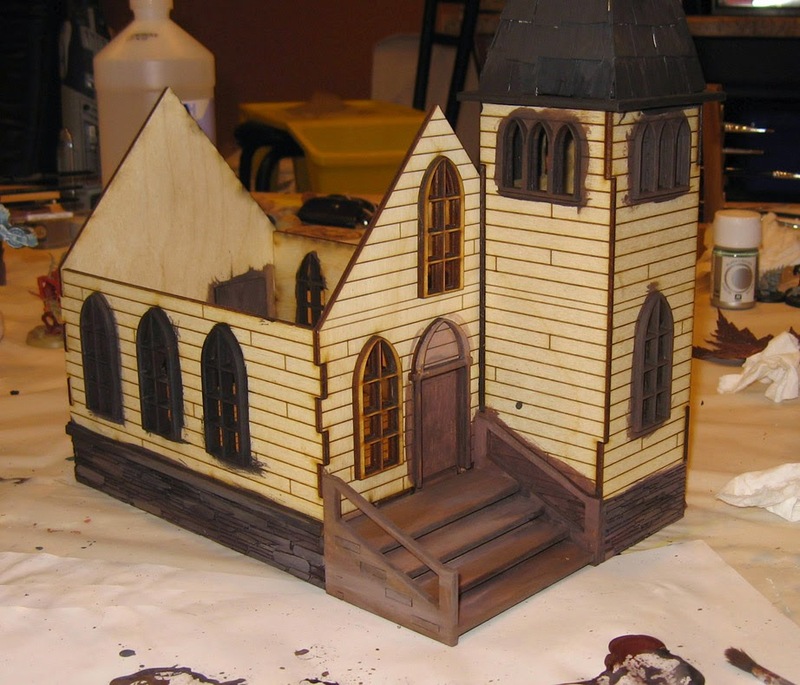 To get the new Burn in Designs church ready for Adepticon was going to require paint and cereal. Well... at least cereal boxes. 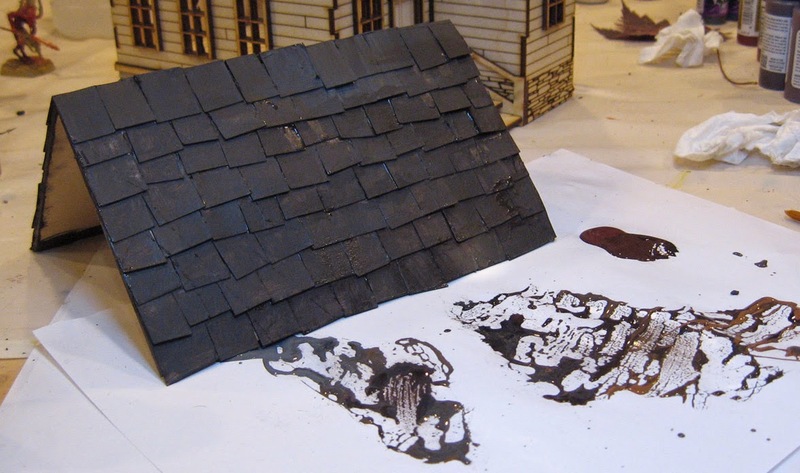 To finish off the roof and give a little extra texture, I chopped up a cereal box to make a few quick shingles. I also made some stones for the bottom foundation. 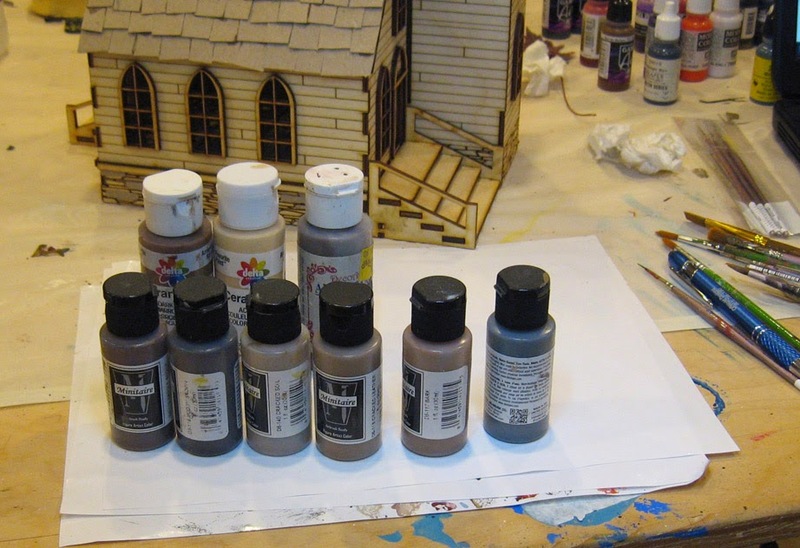 Time to break out the craft paints and some airbrush colors, as they already have that thinner, easy flowing consistency you have heard me mention before. 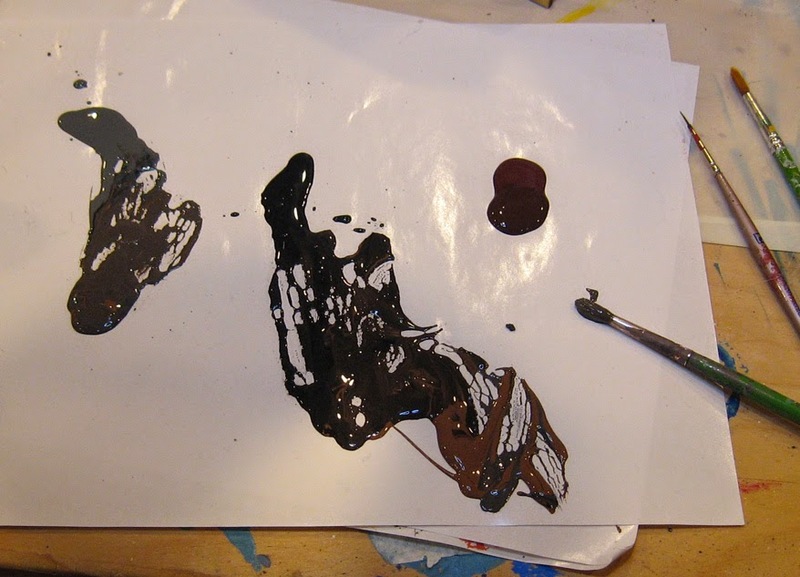 A few colors arrayed on the palette. I wanted to have some warmer and cooler shades to work with, as well as lighter and darker colors. You can see this play out on the surface. 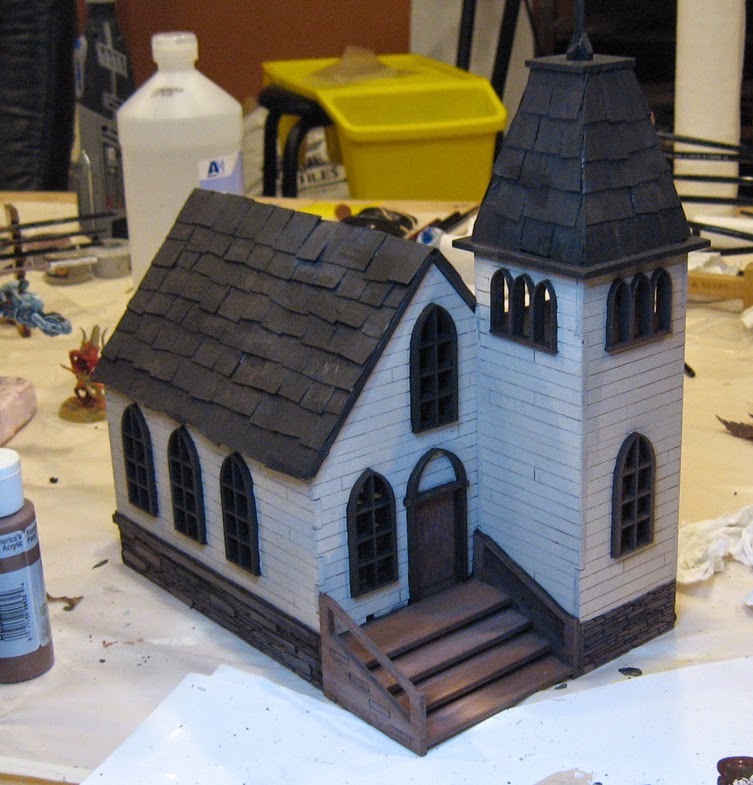 I put down some of the darkest colors along the edges, and then went back in with lighter tans and grays, even allowing them to mix right there on the shingles. 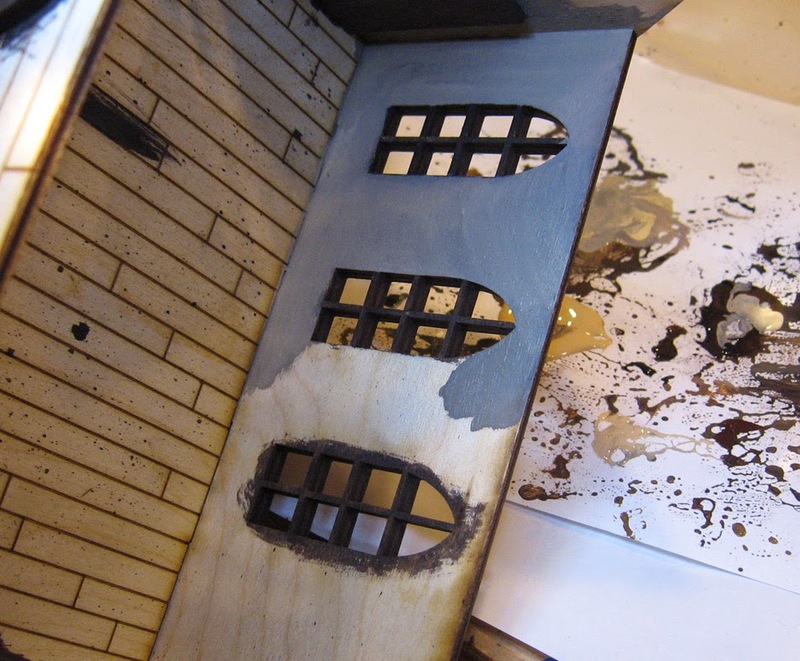 These are early layers, which are meant to cover the heavy texture. Subsequent layers will be lighter, with even more varieties of shades, including more greenish colors in places. 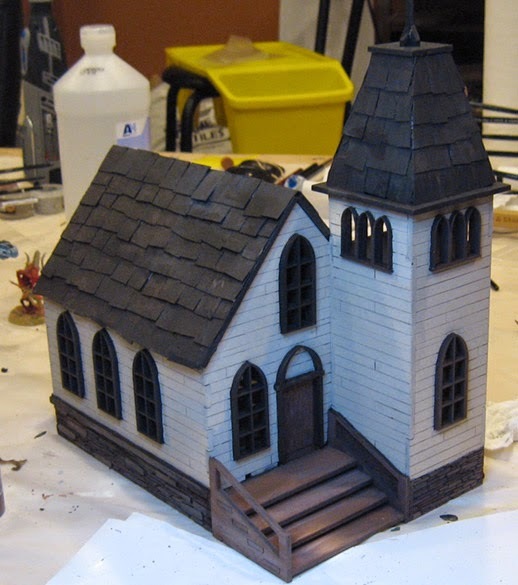 This looks like it is just black, but there is already some tans, reds, grays, and other colors that I can build upon moving forward. 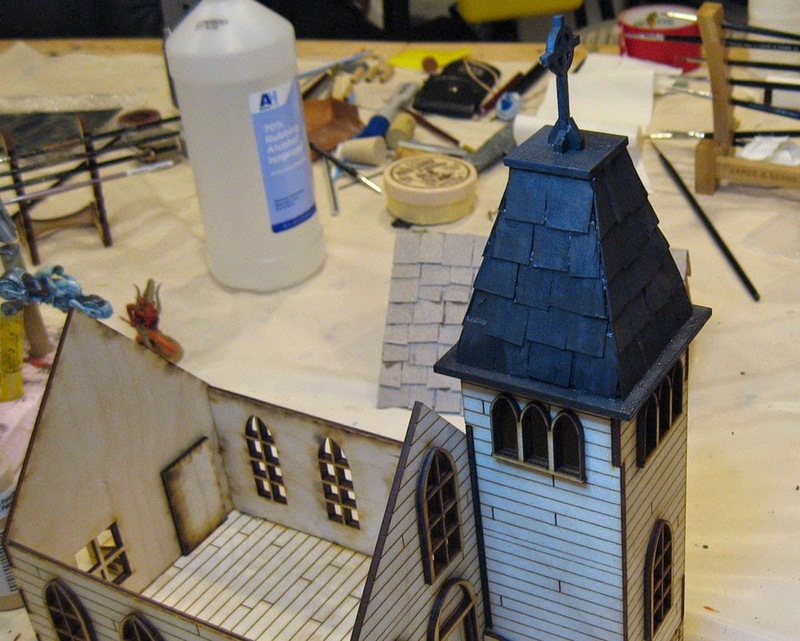 The same process was done on the main roof. 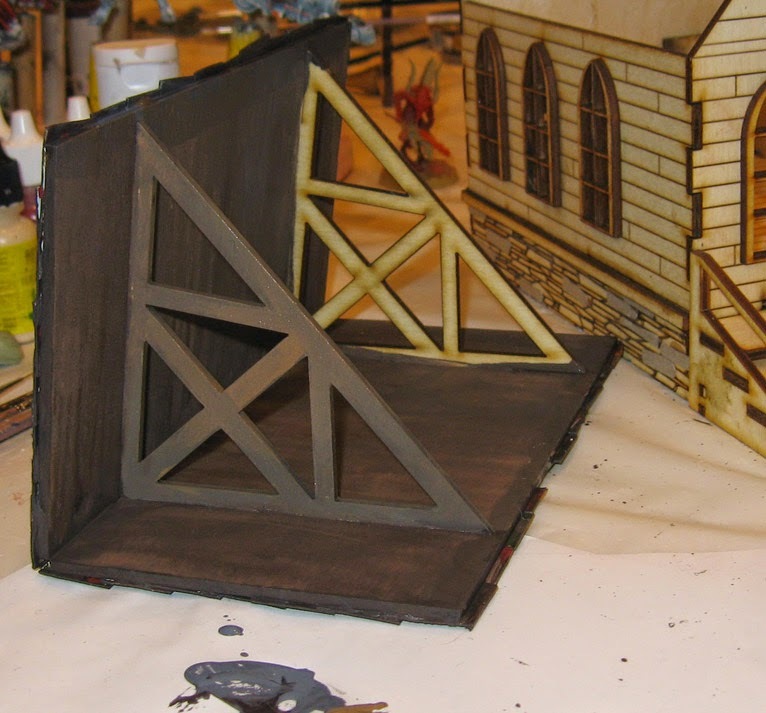 The inner section of the roof was fun, as it had some neat rafters! 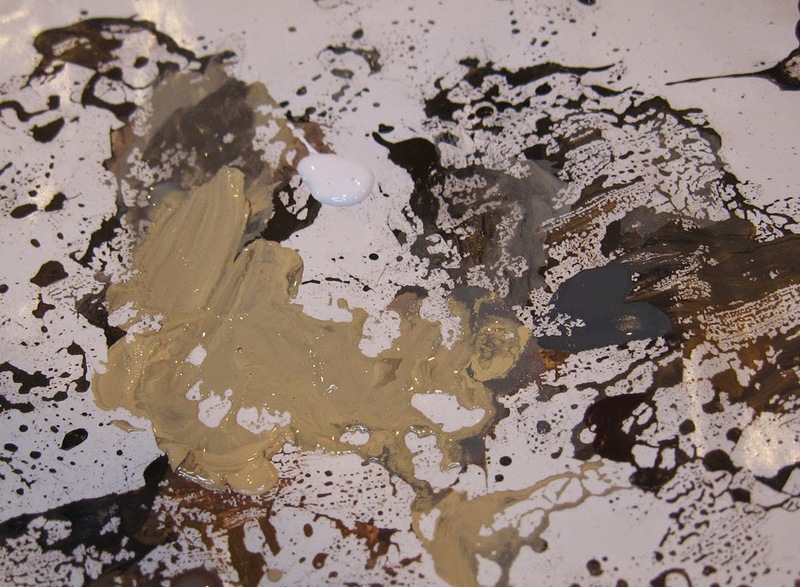 Working quickly with the larger brushes, I was able to blend a cooler grey brown mix into a yellowish tan. Again, this is just a base. Hence Shaded Basecoat! Yes, even on buildings. :-) More to come!! !